Olga Rosina, diamond expert from Russia, talks about how unbiased online price estimators can be more helpful than price lists. Kuala Lumpur, Malaysia, September 15, 2018 --(PR.com)-- Buying a diamond is an exciting experience, it can also be stressful and confusing. Diamond trade has for very long been dominated by brokers and middlemen. Buyers almost never, get to know who the real seller is and the price quoted by the true owner of the diamond is never disclosed. Olga Rosina has been in the diamond industry for a couple of decades, she has worked for two of the largest rough diamond mining operations in Russia. She is also an expert advisor to the GLITZKOIN diamond blockchain project. Olga has some useful tips to offer, these should be of interest to every diamond lover. Diamond price lists published by leading jewelry and diamond houses, are the most popular references that diamond buyers rely on. Olga points out that, these lists are biased in favor of the diamond seller. It is business after all and every businessman or woman, will try his or her best to justify the price that they quote. In her opinion, online diamond calculators or estimators can be reliable if, they are published by an unbiased source. Estimators are handy tools that require the 4c parameters to be entered. Built in algorithms make a market price estimate, based on the overall demand and supply for a similar diamond. The accuracy is generally within +/- 20% of the actual price. As mentioned above, a diamond price calculator or estimator, would require the 4c’s of a diamond to be entered, so what are the 4Cs. The color, clarity, carat (weight) and cut of a diamond are referred to as the 4Cs. A casual diamond buyer or a novice, would surely not be very familiar with these terms. Very rarely does a diamond buyer go for the "best" ratings for each of these C’s as, such a stone would carry a significant premium. Olga with her experience in the glittering stone, offers some advice regarding the 4C parameters. The C – carat weight is something that the buyer will need to decide. When picking the C for cut, a rating of ‘good’ should suffice in most cases. The C – color, could be in the H-J range, this is a diamond that will appear "white" to the eye. The last C which denotes clarity, could be VS1 or VS2. In cases where the buyer has some very specific 4C parameters in mind, it is best to follow those. 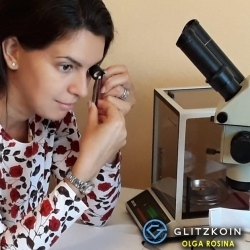 Olga Rosina explains that, the DiaEx Diamond Exchange being developed as part of the GLITZKOIN project, does have a Diamond Price Estimator (DPE). Since the DiaEx platform is open to both buyers and sellers of all sizes, it is fair to presume that the DPE would give an unbiased price estimate. The price estimator gathers data related to demand and supply, from leading diamond markets across the globe. Multiple algorithms are deployed to assess, the price based on the entered 4c parameters and the analyzed market information. The Diamond Price Estimator can be accessed from the main website at www.glitzkoin.com click the PRICE ESTIMATOR tab and proceed to enter the 4C parameters. The DPE is open to everyone and there is no charge to use it. More importantly, users of the GLITZKOIN diamond price calculator, are not obliged to trade on the DiaEx Diamond Exchange.